Spring and summer are the perfect seasons for showing off gorgeous flowers, so if you're planning on including blooms in your centerpiece, you have plenty of options. If you're going for a patriotic vibe, opt for red, white and blue blooms, including roses, carnations, lilies, mums, shasta and gerbera daisies, hydrangea, geraniums and tulips. Or, you can embrace the sunny season by mixing in a few yellow blooms, like daffodils. Whatever you choose, make sure they're delivered no earlier than the day before so that they're as fresh and vibrant as can be when you show them off on your patio table. The Fourth of July is the perfect occasion to go for a more rustic party theme, especially since the party is already outdoors. So, opt for more rustic centerpieces if you want, like flowers arranged in mason jars or even watering cans. Just because you're serving up hot dogs and burgers doesn't mean you can't turn the traditional grill foods into their own beautiful centerpiece. Place your food selection on cake stands and platters of various heights, and arrange them across the table in a random pattern. Then, put small white votive candles in various spots around the food, and the whole thing will seem casual, yet sophisticated. Centerpieces don't have to be extravagant, especially for such a relaxed and informal holiday. In fact, the perfect centerpiece may just be a single kind of flower arranged in a simple vase. One option? Red tulips in a blue glass vase – your guests will love the simple and beautiful effect. If you'd rather take up less space but still adorn your table with pretty blossoms, consider using bud vases. Fill the small containers with one or two red, white or blue blooms, and stick a couple of miniature American flags in some of them. The end result: pretty and patriotic! 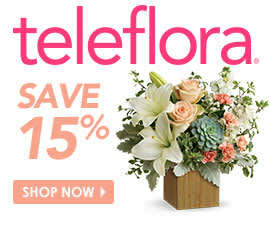 If you're looking for an extra-special centerpiece, or a gift to send to a family member who can't be at your holiday barbecue, Teleflora's America the Beautiful arrangement is an amazing option. Its statement-making asiatic lilies, red roses and carnations pair perfectly with the added American flag and cobalt-blue glass vase.